Hi, I bet you all have been wondering where I have been. 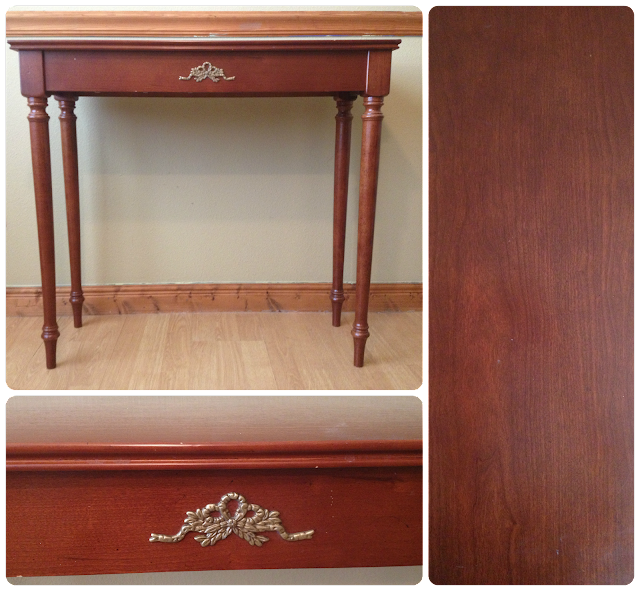 Well, for the past two weeks I have been concentrating on scavenging for old pieces of furniture and remodeling them. I didn't think I would do this, but the opportunity presented it self and I went for it. I do find it difficult at times to manage everything, but I am determined to make this work. I manage my time and give a little to housework, kids, hubby, cooking, cleaning, working out, painting, picking and myself. Not necessarily in that order. I do want to share with you the work I have been doing and the products I used. I also plan on explaining how to use these products. 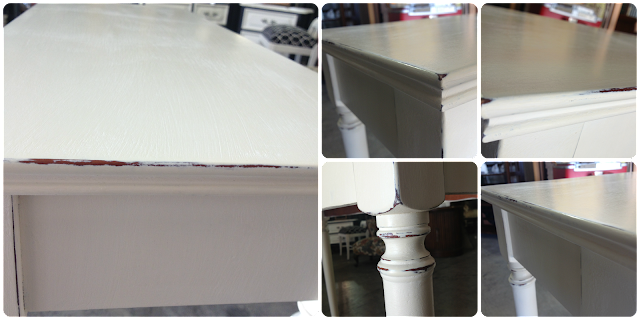 I went with Annie Sloan Old White and clear wax. I just love how it turned out. What do you think? Do you remember back in April 24, 2012 I wrote a post on chairs I planned on redoing? Well, I am redoing them now. LOL, click here to see a before. This is just one chair, I have three more to go, but what do you think of this chair? 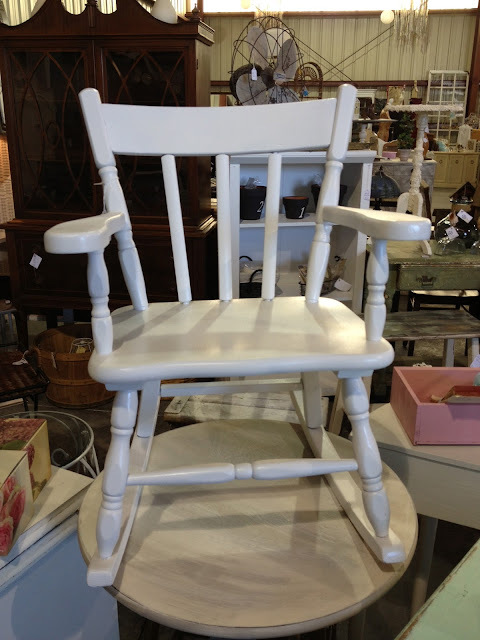 I wanted this child's rocker to be for a boy or girl. I spray painted it pure white and than I sealed it. I love how it turned out too. I have a foot stool, ottoman, and some frames to share with you in a couple of days. I'll keep posting on Tuesdays and Thursdays. I appreciate you coming along with me on this new adventure. Thank you so much for stopping by and I LOVE your Sweet comments. Vanessa how exciting! Congratulations on your new business you are going to be a great success. You're so talented, I love how the table came out. Congrats on your new business. You'll do great. I love Annie Sloan paint. That table looks really beautiful. Keep up the great work Vanessa! Thank you so much for your sweet comment. I appreciate you stopping by. Congrats! Your pieces are so lovely! Everything looks great girl!!! Congrats:) Looks like you are having fun! 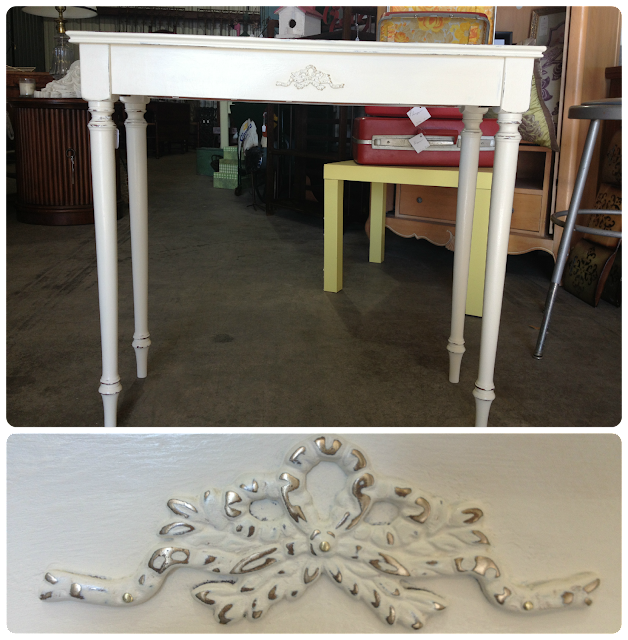 Love love love the foyer table!